Police are investigating a "serious" security breach after a civil servant lost top-secret documents containing the latest intelligence on al-Qaeda. The unnamed Cabinet Office employee apparently breached strict security rules when he left the papers on the seat of a train. A fellow passenger spotted the envelope containing the files and gave it to the BBC, who handed them to the police. The official was later suspended from his job, the Cabinet Office announced. Home Secretary Jacqui Smith now faces demands for an official inquiry. Keith Vaz MP, chairman of the powerful Home Affairs select committee told the BBC: "Such confidential documents should be locked away...they should not be read on trains. "I will be writing to the Home Secretary to establish an inquiry into the affair." The Conservatives backed calls for an inquiry, with their security spokeswoman, Baroness Neville-Jones, describing the loss as the latest in a "long line of serious breaches of security." Home Office minister Tony McNulty told the BBC he was awaiting the results of the police investigation. The two reports were assessments made by the government's Joint Intelligence Committee. 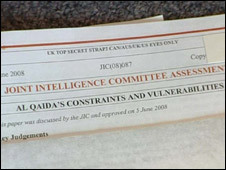 The other document, reportedly entitled 'Al-Qaeda Vulnerabilities', was commissioned jointly by the Foreign Office and the Home Office. Just seven pages long but classified as "UK Top Secret", this latest intelligence assessment on al-Qaeda is so sensitive that every document is numbered and marked "for UK/US/Canadian and Australian eyes only", according to our correspondent. According to reports, this document may have contained details of names of individuals or locations which might have been useful to Britain's enemies. However, it appears that in a serious breach of the rules, the papers were taken out of Whitehall by an unnamed official and left in an orange cardboard envelope on the seat of a Surrey-bound train from London Waterloo on Tuesday. When a fellow passenger saw the material inside the envelope, they gave it to the BBC. Reports suggest that the official, described as a senior male civil servant, works in the Cabinet Office's intelligence and security unit, which contributes to the work of the Joint Intelligence Committee. His work reportedly involves writing and contributing to intelligence and security assessments, and that he has the authority to take secret documents out of the Cabinet Office - so long as strict procedures are observed. Once the documents were reported missing, a full-scale search had been launched by the Metropolitan Police, amid fears that such highly sensitive material could have fallen into the wrong hands. Our correspondent said that across several departments in Whitehall on Wednesday evening there is said to be "horror" that top-secret documents could have been so casually mislaid. Any inquiry is likely to focus on the Cabinet Office, and the security procedures that made it possible for sensitive information to be allowed out of a secure environment. A spokesman for the Cabinet Office said: "Two documents which are marked as 'secret' were left on a train and have subsequently been handed to the BBC. "There has been a security breach, the Metropolitan Police are carrying out an investigation." The spokesman declined to discuss the contents of the documents. One Whitehall source sought to play down the impact of the breach: "The embarrassment of the loss is greater than the embarrassment of the contents of the documents. "We don't believe there is a threat to any individuals in what was in these documents if they had got into the wrong hands." A Metropolitan Police spokesman said: "We are making inquiries in connection with the loss of documents on June 10."